A “cold” war, as opposed to a “hot” war, is one that does not involve direct military confrontation. Instead, a cold war plays out through competing economic systems, military alliances as well as arms building and the accumulation of other resources, and sometimes through proxy or surrogate wars. In this section, learn more about how the West and East confronted each other throughout the Cold War. The Marshall Plan (or the European Recovery Program) was a direct consequence of Containment policy. It was an economic and social reconstruction plan for Europe designed to speed up recovery in the countries still suffering the effects of WWII. The plan is named after Secretary of State George Marshall, who presented the theory behind the plan in a commencement address at Harvard in 1947. He believed that economic stability was key to political stability, and crushing Soviet influence, in Europe. Once talks began to put the plan in place, all of the Allies, including the Soviet Union, in an effort to gain Stalin’s trust, were invited to a meeting in Paris to negotiate the terms of American aid in Europe. Unsurprisingly, Stalin was extremely skeptical of the plan and believed it would create an anti-Soviet bloc. Though the aid was open to all European countries, Stalin ordered those under his Eastern Bloc to reject American aid, and created a Soviet plan as a response to the Marshall Plan. Belgium. The Marshall Plan has helped repair the ruined docks and wharves of Ostende, one of Belgium’s principal fishing ports. 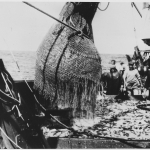 A netfull of fish is emptied onto the boat deck. Discover more through the photograph. Belgium. 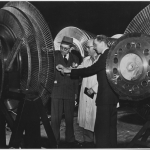 Belgian electrical engineers inspect the rotor of a 40,000 kilowatt turbine during their visit to GE’s new turbine manufacturing building at Schenectady, New York. Discover more through the photograph. France. 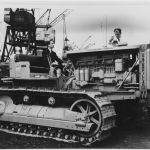 Marshall Plan aid to France included this Caterpiller bulldozer shown here arriving in 1949 to help rebuild that country’s electric power system. Discover more through the photograph. In 1948, President Truman asked Congress to pass the Economic Cooperation Act establishing the Economic Cooperation Administration (ECA) to facilitate implementation of the Marshall Plan in 16 western European countries. Aid under the Marshall Plan first went to Greece and Turkey to continue to crush communist influence there. Under the plan, money was transferred to each European government. An American advisor from the ECA, and local government, business and labor representatives oversaw the implementation of funds. Money from the Marshall Plan was mostly used to buy American imports like food and fuel, as local sources had been wiped out by the war. Once basic needs were stable, the money was used to physically reconstruct infrastructure and industries. In total, the Marshall Plan supplied Europe with more than $12 billion from 1948-1951, divided based on population and industrial power. The United Kingdom received the most ($3 billion), followed by France ($2 billion) and West Germany ($1.5 billion). Between 1948 and 1952 European industrial production increased by 35 percent and agricultural exceeded pre-war production levels. Standards of living increased dramatically. Experts disagree on how much credit is due to the Marshall Plan; however, they largely agree that it sped up recovery, and was certainly instrumental in reducing political discontent and stemming the communist tide in Western Europe. The Council for Mutual Economic Assistance (founded in 1949 by the Soviet Union, Bulgaria, Poland, Romania, Czechoslovakia and Hungary) was Soviet Union and Eastern Bloc reaction to the Marshall Plan and Organization for European Economic Cooperation in Western Europe. Since Marshall Plan aid was extended to all countries in Europe, including those aligned with the Soviet Union, Stalin was worried that his communist allies would be pulled into strong economic relations with the West and created his own economic assistance plan to keep them in line. 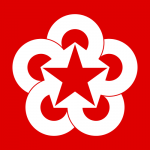 In the beginning of negotiations, the plan was for COMECON to be a forum for coordination of national economic plans through unanimous ratification of any changes or new policies. However a year later, Stalin increased the authority of COMECON in directly intervening in member states, especially in areas of foreign trade. Read the original text of the North Atlantic Treaty through the image. The North Atlantic Treaty Organization (NATO) and the Warsaw Pact were the military alliance equivalents to the Organization for European Economic Cooperation and COMECON in their respective blocs. 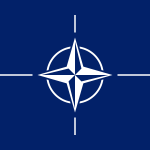 NATO was founded in April 1949 by 10 Western European nations, and the United States and Canada. It is an intergovernmental military organization based on a system of mutual and collective defense. This cooperation is guaranteed by Article 5 of the North Atlantic Treaty, which states that an armed attack against one member is to be considered an attack against all members. However this article was not invoked until well after the Cold War, following the Sept. 11, 2001 attacks on the United States. According to the first Secretary General Lord Hastings Ismay, the aim of NATO was “to keep the Russians out, the Americans in, and the Germans down,” and emphasized the importance of trans-Atlantic relations between the U.S. and Europe. General Dwight D. Eisenhower, Supreme Allied Commander, at his headquarters in the European theater of operations. He wears the five-star cluster of the newly-created rank of General of the Army (1945). The outbreak of the Korean War in 1950 served as NATO’s first true test of military cooperation. Before the war, the organization was mostly a political alliance; however once the war broke out, it was forced to organize a formal military structure and strategy. 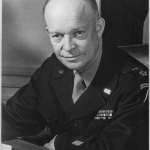 Members formed the Supreme Headquarters Allied Powers Europe (SHAPE) as the command center, selected Dwight D. Eisenhower as SHAPE Commander, and began military exercises in 1952. In order to maintain peace on the European continent, the Soviet Union suggested it join NATO but the proposal was flatly rejected as members questioned the Soviet’s true motives. Soon after, NATO made West Germany a member in order to have access to manpower and territory right at the Soviet border. In response, the Soviet Union, along with seven other Eastern European countries founded the Warsaw Pact with the aim of protecting their countries from NATO’s “threat to the national security of the peaceable states.” The Warsaw Pact reaffirmed “the establishment of a system of European collective security based on the participation of all European states irrespective of the social and political systems….” Similar to NATO’s charter, the Warsaw Pact included an article on mutual and collective defense in the event of an attack on a member state. During the Cold War, the two organizations never engaged in direct combat with each other on the European continent. However, they did meet each other on the global stage, fighting strategically and militarily to contain each other’s influence. 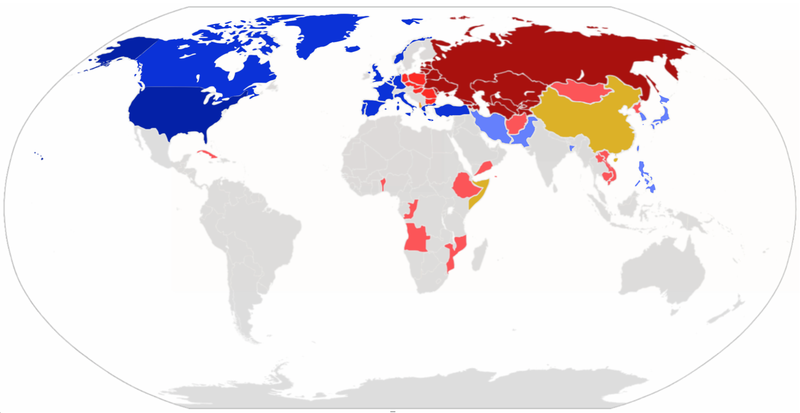 The Warsaw Pact ended with the fall of the Soviet Union in 1990, but former member territories reorganized into the Collective Security Treaty Organization, which includes 6 members and 2 observers. NATO continues today and has expanded its membership to 28 states and several global partnerships.